Mr Tomlin works as a Communication Access Assessor at Scope. Brandon draws on his lived experience as a person with disability to passionately advocate for greater understanding of communication disability. 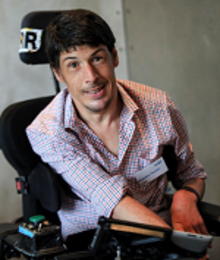 He is committed to living life as independently as he can and seeks to challenge the notion of what a person with a disability can achieve.